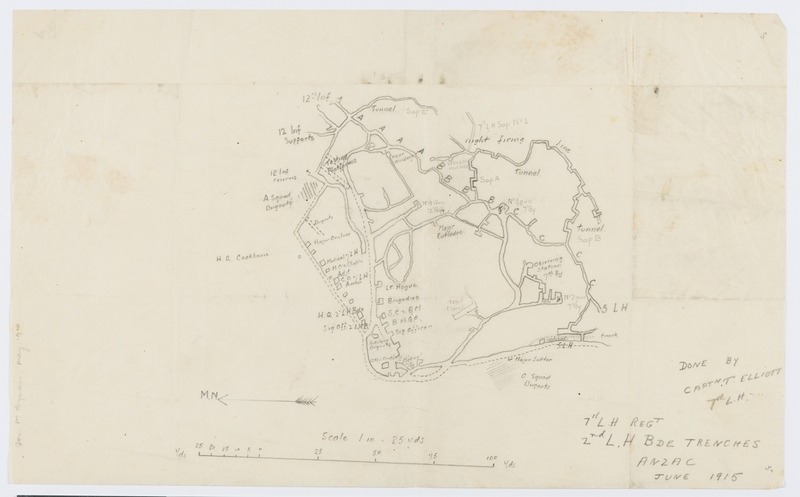 Plan or map of the 7th Light Horse Regiment 2nd Light Horse Brigade trenches at Gallipoli, June 1915 drawn by Captain T. Elliott. Arthur Wellesley Hyman served as a major in the 2nd Australian Light Horse Brigade in the Middle East and France and on the staff of the Fourth Australian Division. He was awarded an OBE for his services, and later attained the rank of Colonel with the Army Legal Corps. This hand drawn maps is from the Hyman papers concerning World War I, 1915-1920. Map relating to ANZAC soldiers in World War 1, from the collections of the State Library of New South Wales.